Philip Rivers awed Tom Brady with a record-setting display of precision and accuracy. 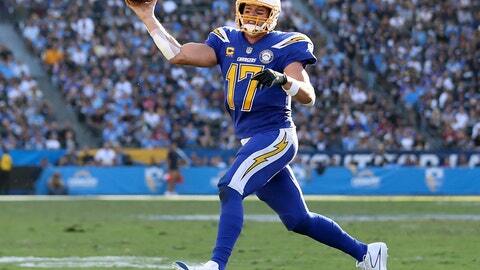 Rivers earned high praise from the only quarterback to win five Super Bowl titles after he tied the NFL mark for consecutive completions and broke records for the most to start a game and the highest completion percentage during the Los Angeles Chargers‘ 45-10 rout over Arizona on Sunday. The almost 37-year-old Rivers connected on his first 25 passes to surpass Mark Brunell’s mark of 22 in 2006, and finished 28 of 29. His 96.6 percent accuracy surpassed Kurt Warner’s 92.3 percent set in 2009. Marcus Mariota also topped Warner by going 22 of 23 in Tennessee’s loss to Houston on Monday night for a 95.7 percent clip. Rivers tied Ryan Tannehill, who needed two games to complete 25 straight passes for Miami in 2015. He moved ahead of Peyton Manning for most yards passing, including postseason, in league history. Brady has 79,416. BROWNIE POINTS: Nick Chubb is the first Browns running back to have at least one touchdown rushing and receiving in two straight games since 1950. … The Browns ended their 25-game road losing streak with a victory at Cincinnati. SPREADING IT AROUND: Drew Brees has thrown a touchdown pass to 13 different Saints players, tied for the most in a season since 1970. Matt Ryan is the other quarterback to accomplish the feat during his MVP season two years ago. SACK, SACK, SACK: Baltimore’s Matt Judon sacked Derek Carr on three straight offensive plays, becoming the second player to do that since sacks became an official stat in 1982. DE JA VU: Jake Elliott kicked a decisive field goal in the final minute of regulation to give the Eagles a victory over the Giants for the second straight season. He booted one from 61 yards out in Week 3 last year and this time nailed a 43-yarder. LONG DISTANCE: Jets kicker Jason Myers has five field goals of at least 55 yards this season, most ever in a single season. NOT JUST A KICKER: Pittsburgh’s Chris Boswell became the first player to throw a touchdown pass and kick a field goal in the same game since David Akers in 2012. Offensive lineman Alejandro Villanueva was on the receiving end of Boswell’s pass. OPPOSITE EFFECT: Amari Cooper has three TDs receiving in four games with the Cowboys after he was acquired from Oakland. Golden Tate has just 11 catches for 97 yards and no scores in three games for Philadelphia following a trade with Detroit. JULIO’S 100: Julio Jones has 100 yards receiving six straight games, longest streak in Falcons history. RUNNING RAVENS: The Ravens have rushed for more than 200 yards in consecutive games for the first time since 2012. They are 24-2-1 when doing so. SELECT COMPANY: Tampa’s Mike Evans has joined Hall of Famer Randy Moss (six) and A.J. Green (five) as the only players with 1,000 yards receiving in each of their first five seasons. SCRAMBLIN’ MAN: Josh Allen’s 99 yards rushing were the most by a Bills quarterback since 1960. MR. CONSISTENCY: Frank Gore has run for 500 yards in 14 consecutive seasons, longest streak in NFL history. ONE LOSS TOO MANY: Since 1990, only 12.3 percent of teams that started 5-6 made the playoffs while 45.4 percent of teams to start 6-5 made it. OFFENSE WINS: Nine teams have allowed 500 yards in a game and still won. That’s the most in a season in the Super Bowl era.